Microsoft Dynamics GP 2018 R2 is schedule to be released October 1, 2018. This will be a release packed with core features for Microsoft Dynamics GP customers. 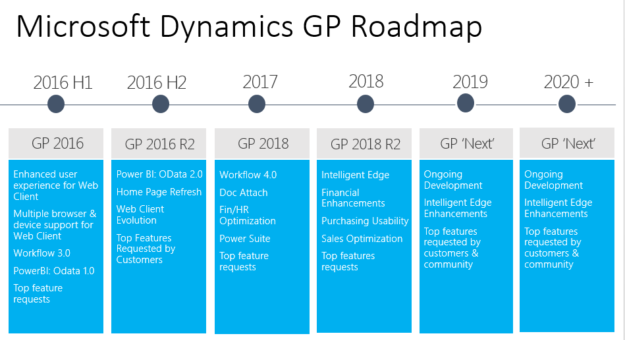 You will notice something new on the Dynamics GP Roadmap that is getting attention called Intelligent Edge. When you install Dynamics GP 2018 R2 you will see a new tab on your home page talking about Intelligent Edge. More on that in future blog posts. Microsoft is continuing to invest in Microsoft Dynamics GP and we are exciting about these enhancements. If you are evaluating Microsoft Dynamics GP or if you are interested in upgrading your current Microsoft Dynamics GP system contact CAL Business Solutions. Call 860-485-0910 x4 or [email protected]. Clearing ACA Confusion: Which Employees Get IRS Form 1095-C? Thank you for awesome blog. I followed each and every step. and it is successful.